The occupants of 90 Phnom Penh households whose homes were partially or completely dismantled to make way for the Railway Rehabilitation Project partly funded by the ADB have demanded the bank offer them fair compensation. In a letter submitted to the Inter-Ministerial Resettlement Committee, the ADB, the National Assembly and the Ministry of Economy and Finance yesterday, the villagers argued they had been unfairly locked out of compensation due to technicalities despite valid claims. Luy Im, a representative of 23 complainants from Toul Sangke A, said she received only $100 in compensation after the front of her house was destroyed in 2011 to accommodate the works. “I need more compensation, but I don’t know how much. I spent a lot of money to repair my house since the front of my house was demolished when they expanded the railway,” she said. Im said she went into significant debt making the repairs. The complainants, who include six households from Phum III and 65 from Tapeang Anhchanh, want the IRC to intervene because their compensation requests through one avenue of the ADB’s accountability mechanism have been rejected on the grounds that they were accepted via another. In other words, receiving limited compensation disqualified them from the larger sums other households have received. It was unreasonable to expect that villagers could be aware of such complex technicalities, said Nora Lindstrom, program development manager at NGO Sahmakum Teang Tnaut. “That raises the question of how are the villagers ever going to do this, how are they meant to know this type of stuff?” she said. ADB country director Eric Sidgwick said in an email that the bank’s Compliance Review Panel was “reviewing resettlement issues including those related to compensation”. “In the meantime, the households represented in the three letters received today have been advised to present their complaints through the Project’s Grievance Redress Mechanism,” he wrote. Credit Union Foundation Australia (CUFA) has posted an article on their website extolling how households evicted from the railways are pleased with their new legal shelters. CUFA recently signed an agreement with AusAID for an unspecified amount to provide financial literacy training to households relocated as part of the ADB and AusAID funded railways rehabilitation project. The logic seems to be that affected households are in debt not because low compensation rates and badly planned relocation, but because they don’t know how to manage their finances. You can read CUFA’s article here. Evictees of the national railway rehabilitation project are stepping up pressure on the Asian Development Bank, submitting a petition to the funder today about violence at the relocation site a week after a similar complaint on livelihoods was filed. Evictees strike in front of ADB in Phnom Penh. Photo by Heng Chivoan. 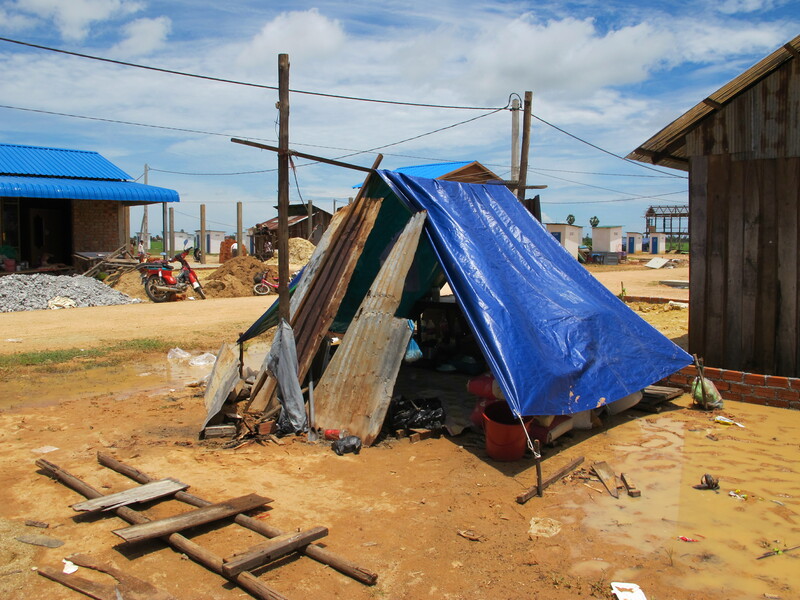 Ros Bopha, representative of about 160 families relocated to Por Sen Chey district’s Trapaing Anchang village, said clashes on Thursday between residents of the area and the evictees had injured nine – two seriously. Village chief Chan Sinara had been angered when evictees invited doctors from rights group Licadho without informing him, she said. He had banned the doctors from visiting villagers and used inappropriate words towards Ros Bopha, she added. “I want ADB to know people living here are not provided with security and our living standard is worse [than at the original location],” she said. The evictees also planned to lobby senior authorities to replace Chan Sinara as chief because he did not work on behalf of the villagers, she said. Families displaced by the rehabilitation of the Phnom Penh portion of the beleaguered US$143 million project last week petitioned ADB president Haruhiko Kuroda for help creating jobs and developing infrastructure at the relocation site. Chan Sinara could not be contacted yesterday but Ros Vanna, Trapaing Krasaing commune chief, said the dispute was a headache for local authorities. “They [evictees] are newcomers and always make problems,” he said, before hanging up. Authorities in Banteay Meanchey province’s Poipet town issued a notice on March 27 giving those who lived on the tracks 10 days to move. ADB officials could not be reached for comment yesterday, but an ADB spokesperson told the Post on Friday that areas designated for relocation would have adequate infrastructure. “The plot of land will have basic amenities, such as access roads, water, electricity, latrine and sewage system with water and electricity connected free of charge,” the spokesperson said.